Well, the Railway Modellers’ Meet is in the can for 2017. Everyone seems to agree that it was a super event. Pembroke was on the self-guided layout tour, which took place today around mid-day. I was still sweeping the silk tree leaves off the driveway when the first guests pulled up, and for four hours I always had two to five people reviewing my efforts. As expected, they were very polite (it is Canada, after all), and I didn’t hear a single comment that could possibly offend me. As a host, it was an extremely positive experience, and I would encourage anyone with a layout to host a layout tour as well. The meet provided a lawn sign to help guests find my house. I augmented it with signs to help them find the layout once they were here. I recruited my family to help greet guests at the door, encourage them to sign the guest book, which we put on a card table by the front door, and direct them downstairs. I hung photos from the fascia related to the locations on the layout. I also created a couple of short chronologies and a map and hung them beneath the staging yard. Laura made cookies and a plate of cheese and crackers, and put them on a table in the layout room. I played a slideshow from the layout construction set on Flickr. Add a push for this blog so that people can follow progress in the future (if they care). Turn off the screensaver on this computer so the slideshow doesn’t stop. Put some of my books and articles out. 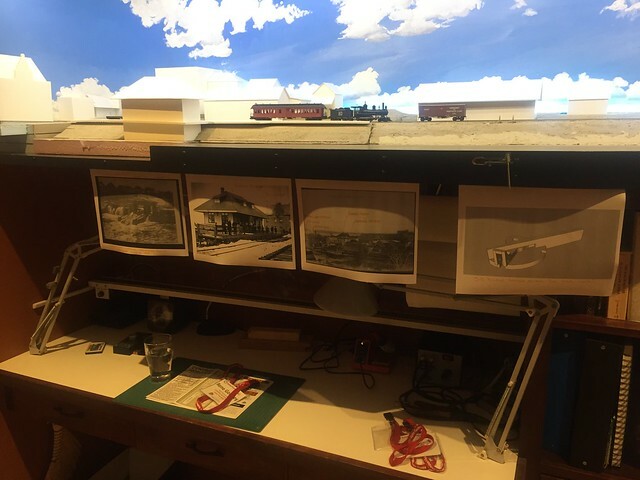 I wound up putting the book on the passenger car and my locomotive on my workbench. Put a couple of prototype resources, like Niall MacKay’s book, out. I got it out about midway through the event. If the layout had been running, I wouldn’t have been able to answer questions and run the train. So, I will need an engineer next time. It sounds like an excellent event! So glad it was a positive experience. That kind of thing is energizing and inspirational to get more done for the next visitors. Yes indeed, though it’s hard to imagine putting more energy into it next time! My family misses me! I’m glad you had a great experience! I love touring others’ layouts. Glad to read it all worked out so well. The Meet itself sounds like a wonderful event and is certainly something I hope to attend at some point. By the way, I really like how well the layout appears to fit into the space it lives in. The space itself looks superb and the layout a part of it not just in it. You should dust off some air miles and come in May, Chris. :-). We have an even better clinic program planned.